As i have mentioned before i have some locations that are frequently visited by theives and always got broken into, the problem is i don’t have the time on my hands to spend 2 to 3 hours on the location and make a DIY Security system of hasps. 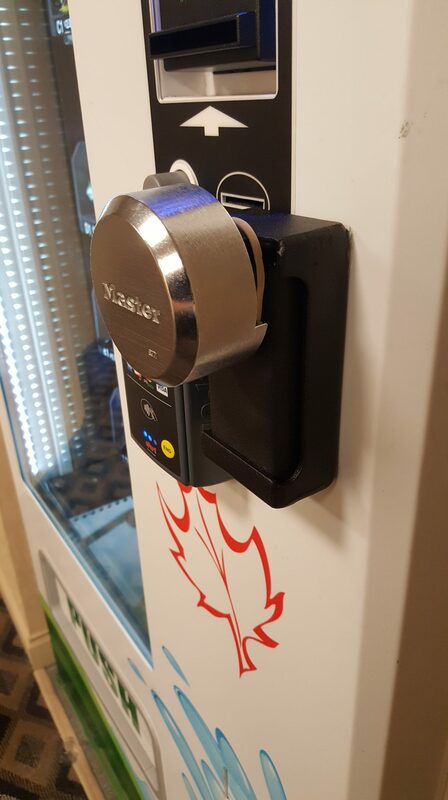 If you have let’s say public locations with your vending machine that is accessible anytime and on a 24 / 7 basis then i would strongly suggest that you have to take necessary precautions, to avoid the experience that i have been through. The people who always goes to your location and steals your money constantly try to find ways on breaking your newly DIY security device especially if you did it unprofessionally. i have about 8 vending machines and it is always visited about 2x a year and they try to break the locks and steal all the items inside : coin mech + top portion of bill validators + cash inside cash box. The technique for this not to allow it to happen again is to buy a security hasp / cover that will slow them down and to a point that they will give up and if it will take more than 5 to 10 minutes in opening the vending machine, there will be cops already waiting already with passersby calling 911 or enough time for the security to obtain a video tape for submission to the police. How To Get More Vending Business Locations ?